Pork chops once were fatty enough to be fried alone in a skillet. These days, pigs are bred so lean that traditional methods could produce that dreaded result: meat as tough as shoe leather and about as appetizing. To avoid such a catastrophe, the age-old technique of brining pork has undergone a resurgence so the meat stays moist and flavorful when it goes under the broiler or on top of the grill. 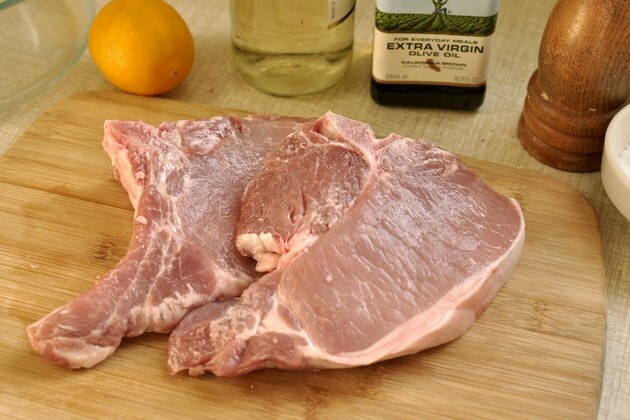 To begin, decide whether to soak pork chops in brine to tenderize and moisturize the meat. To make a brine, prepare a mixture of flavorings and salt water or other liquids, such as beer, apple juice or wine. Use a recipe so you get the proportions correct when you're starting out. 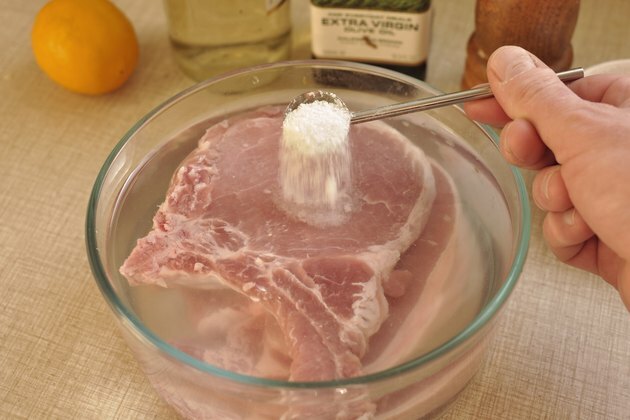 Allow the pork chops to soak in brine for two to three hours in a plastic or glass container just large enough to hold them. Don't over-brine, as it turns the meat mushy, advise Ron Herbst and Sharon Tyler Herbst, authors of "The New Food Lover's Companion." Pat the chops with a paper towel before grilling. Broiling and grilling are essentially the same; the difference is whether the heat source is above the meat (broiling) or below the meat (grilling). 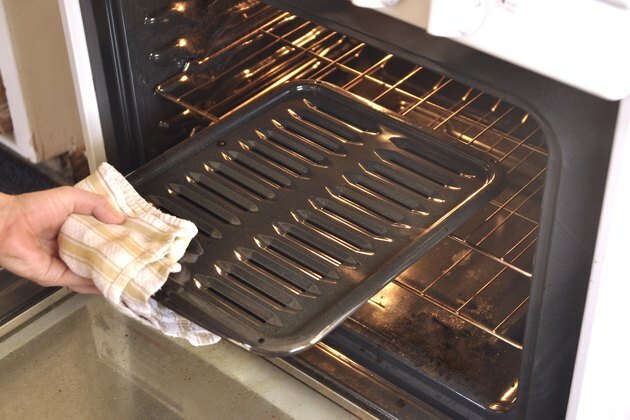 Broiling is the most convenient choice for everyday meals because most ovens have a broiler. 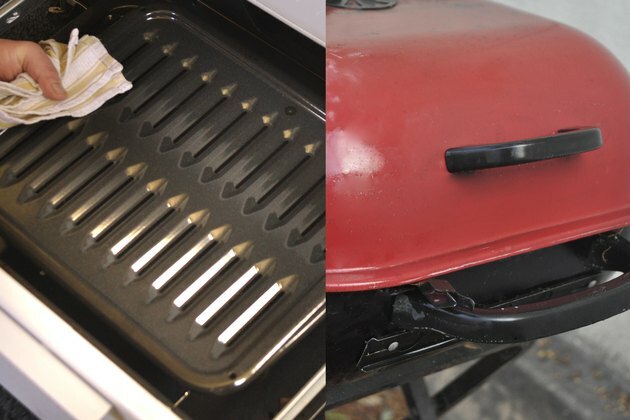 To broil pork chops best, the National Pork Board recommends preheating the broiler pan. The hot surface will help to sear the surface of the meat. Put the pork and broiler pan about 3 to 5 inches from the heat source. Then broil until one side is brown, turn the meat over and brown the other side. When both sides of the pork chops have browned, remove the broiler from the oven and place it on a heat-resistant surface. 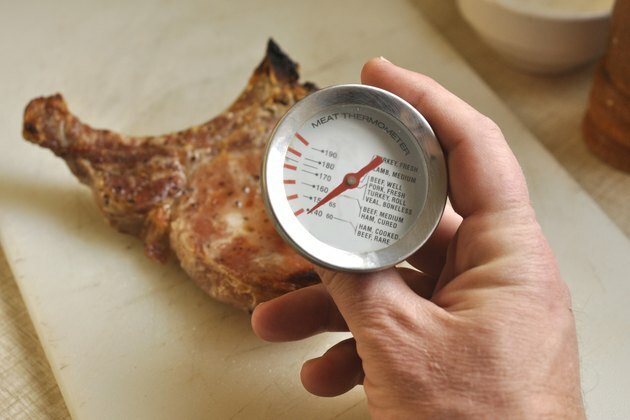 Use a meat thermometer to check the internal temperature, taking care to avoid the bone if the pork chop has a bone. Pork is done when its temperature reaches 145 degrees Fahrenheit. Allow the meat to rest for about three minutes, on a plate under a tent of aluminum foil, before serving.